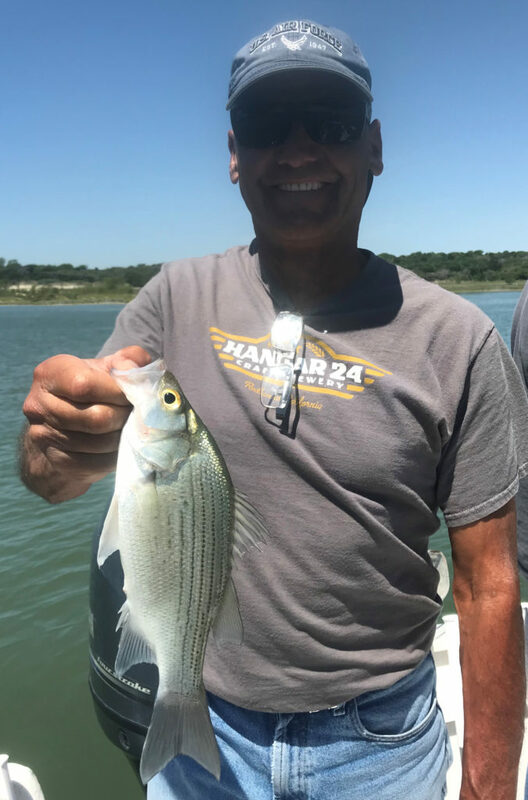 WHO I FISHED WITH: This past Tuesday morning I fished with returning guests Rick Snelgrooes and Stuart Gehrke, accompanied by two other friends of Rick’s, Brad Messner and Dave Gullo, who came out with me for the first time. 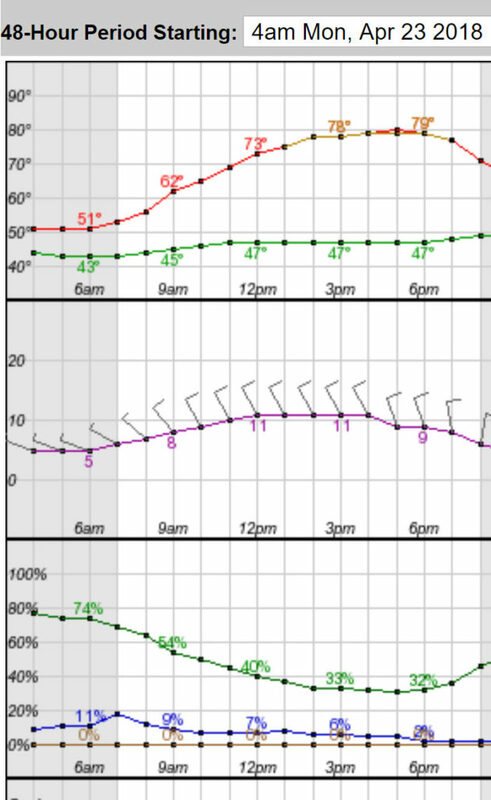 Once again, poor fishing weather really plagued us. We just haven’t gotten any traction from any stable weather all spring thus far. Today, post-frontal clear skies and nearly calm winds made the fishing tough as nails. 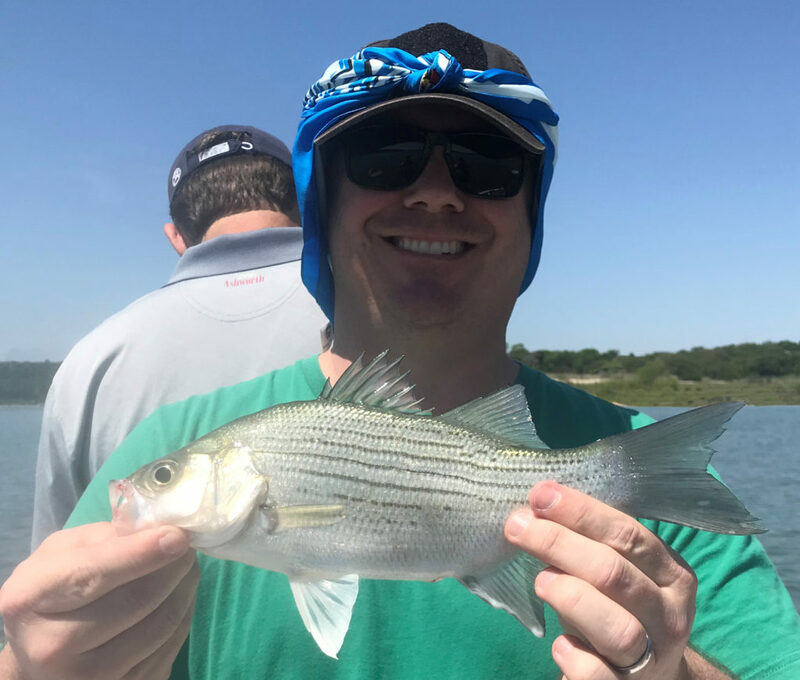 The hybrid bite was next to non-existent, and what white bass we caught came in the noon hour as we enjoyed the first little bit of steady wind we would experience all morning. 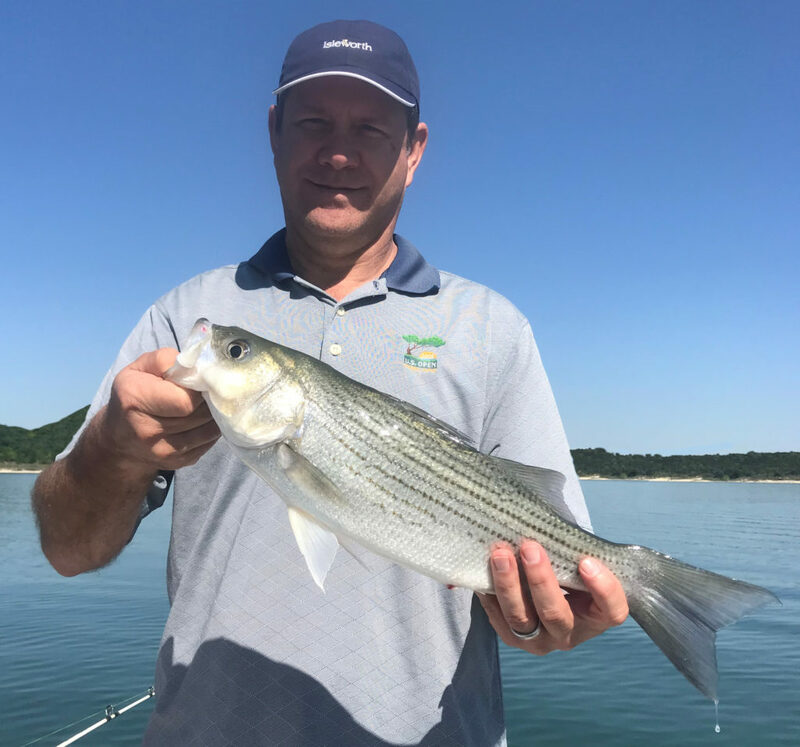 Stuart Gehrke with a Lake Belton hybrid which, due to its slender build, made me look twice to verify that it wasn’t a full-blood striper. Brad Messner, a retired U.S.A.F. instructor pilot and a Californian who normally stalks trout, was really enthusiastic about the techniques we used today, all of which were very new and different to him. Dave Gullo managed to catch a few in between phone calls — no rest for those executive types, you know. 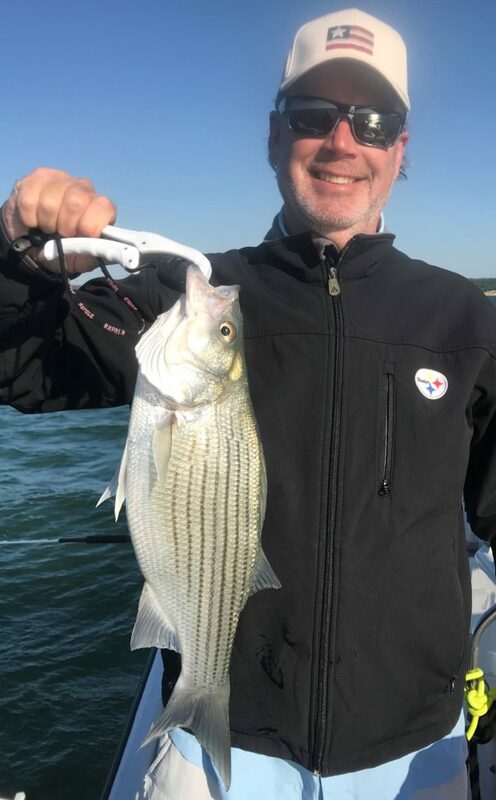 WHAT WE FISHED FOR: This trip was focused strictly on hybrid striped bass in the first 2/3 of the trip, then we saved some time at the end for vertical jigging for white bass. 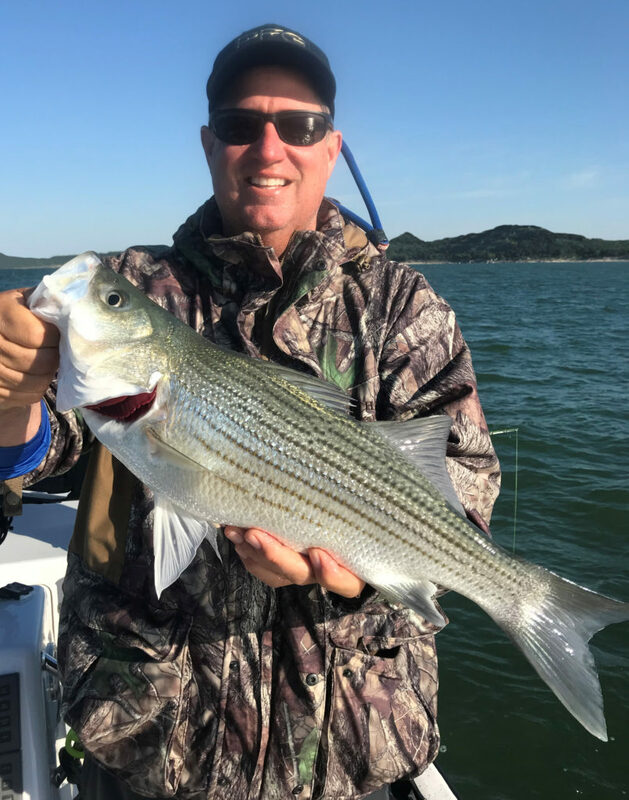 HOW WE FISHED: We fished live shad in a variety of locations, putting a mixed bag of 34 fish in the boat in the first 3 hours of the trip, of which a low percentage were hybrid stripers. We then closed out the trip by vertical jigging with slabs, putting another 42 fish (all white bass) in the boat. Thanks to the first light wind of the day beginning to move the water, we enjoyed some steady action, albeit for smaller, but more numerous, fish. 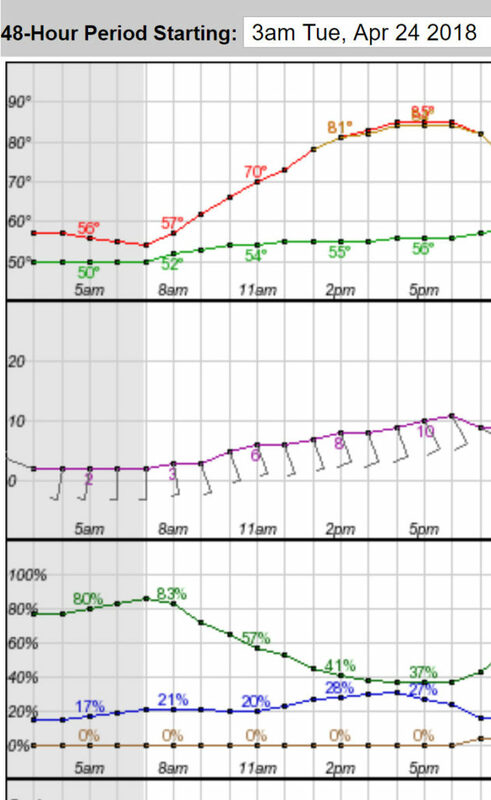 OBSERVATIONS/NOTES: 1) The lack of stability in our weather and the repeated, frequent cold fronts have prevented any consistency in the fishery up to this point this spring. WHO I FISHED WITH: This past Monday morning I fished with Matt Laakso, his son, Mitch Laasko, and Matt’s friend, Matt Beauchene, all from the Austin area. This spring has been plagued with cold, unstable weather, and this morning was no exception, with yet another late April cold front pushing winds from the north west, making the skies cloudless, and dropping the ambient temperature to 48F at launch time, well below the already low lake surface temperature of 65.3, which is well below average for this time of year by a full 5-6 degrees. We caught fish, but it certainly wasn’t fast or furious. 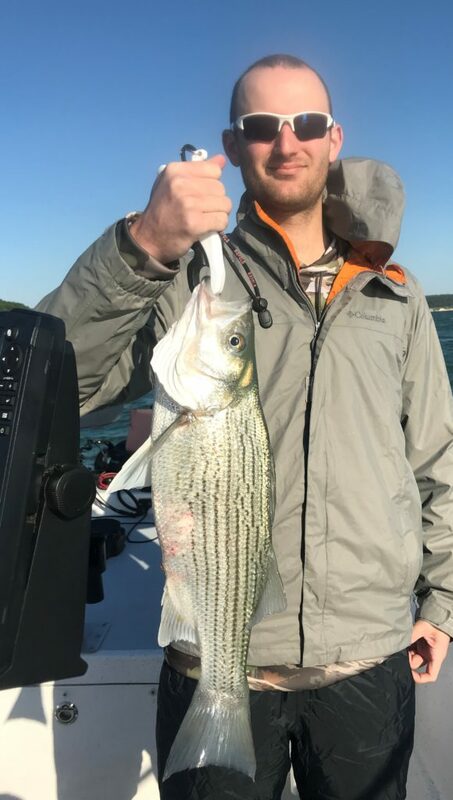 Matt Laakso with one of his birthday trip hybrid striped bass from Lake Belton. Despite poor conditions, we still caught a few quality fish. Mitch Laakso had consistently good technique, especially when it came to taking the rod out of the rod holder without lifting upwards using the circle hooks we had on. Matt Beauchene with a stocky one. HOW WE FISHED: We fished live shad in a variety of locations, putting 18 fish in the boat in the first 3 hours of the trip. We then closed out the trip by vertical jigging with slabs, putting another 15 fish (all white bass) in the boat. Even the white bass were buckled down pretty tightly thanks to the post-frontal, high-pressure conditions.